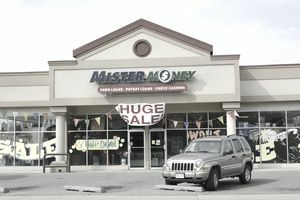 Payday loan stores offer a place to turn when people have a cash emergency, but payday's still a few days away. Many people take advantage of the payday loans offered by non-bank companies. The loans allow borrowers enough funds to get through to their next payday, at which time the loan and interest become due. Payday loans are marketed heavily to people who have difficulty making ends meet each month. Once you start taking out payday loans, it becomes easy to depend on them. Payday loans have a simple application process. You provide your identification, banking, and other details, and once approved, receive your loan funds either right away or within 24 hours. The business explains its service as offering a much-needed option to people who can use a little help from time to time. The company makes money through upfront loan fees and interest charges on existing loans. Payday loan companies operate under a wide variety of titles, and payday loans usually run less than $500.00. Payday lenders may take postdated checks as collateral, and generally, they charge a significant fee for their loans which equates to a very high interest rate, with annualized rates as high as four hundred percent. Many states have been working on passing regulations to place caps on the allowable interest rates and help out consumers that rely on these loans. If you rely on the loans, this leaves you with less to spend on what you need each month, and eventually, you may find you're behind almost an entire paycheck. In most cases, it's best to avoid payday loans at all costs. If you need financial help, investigate other sources first. Some credit unions and banks have begun to offer a similar service of small loans but at much lower interest rates. The interest rates usually compare to a credit card rate, at around twenty percent. It's worth checking to see if you can get a salary advance loan through a bank or credit union. Even though it's best to avoid using a credit card, it is still better than using a payday loan. A credit card gives you more time to pay back the money, with additional flexibility on how you choose to break the payment up. If you can pay the card off in just a few months, you can keep yourself safe from the expensive payday loan cycle. If you have been using payday loans, do your best to stop immediately. Try to make partial payments on your loans so you can lower the balance and stop the cycle of rolling the loan over. Make sure that you can cover the basics at home, such as food, rent or house payment, and your utilities. Put all of your remaining dollars to work paying off the loan. Check to see if your lender will let you make the loan payment in two installments instead of one if this allows you to pay off the debt easier or earlier. Put a temporary stop on other spending until you have paid off your loans and you can make it from paycheck to paycheck without taking out a new payday loan. Try making other changes to break the cycle, such as taking on some part-time work or doing something else to raise money as quickly as possible. See if you have unneeded household items you can sell, or look for short-term, weekend temp work. Since payday loans are relatively small, you may be able to raise the money within a month or two. Careful budgeting and an emergency fund can usually prevent the need for a payday loan. In some ways, needing a payday loan is similar to having constant late payments or overdraft charges from your bank. Planning for expenses ahead of time usually makes the most sense to avoid these situations. If you find that you do not make enough money to meet your current obligations, take a more in-depth look at your spending to see where you can make cuts so that you can improve your situation as quickly as possible. If nothing else seems to help, you may need to get a second job, trade in that expensive car for something more economical and rework your housing arrangements if your house payment is too much to handle. If you have ongoing issues like this, your monthly lifestyle may be mismatched to your current income. After examining and cutting expenses wherever possible, look for a longer-term solution like finding a more high-paying job or going to school to acquire new skills so that you can create more solutions for yourself in the future.